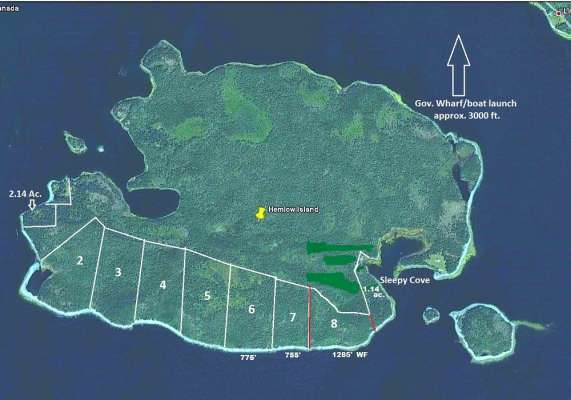 Four oceanfront properties located on Hemlow Island in Liscomb Harbour near the mainland; Lots 6, 7 and 8 (surveyed) total of 54.56 acres (22.08 ha.) and 2,815 feet (858 m) of direct oceanfront with south exposure; plus the Sleepy Cove lot 1.14 acres, 426 feet (129.85m) situated in a sheltered cove for protected anchorage and mooring. Sleepy Cove features very protected deep water anchorage, excellent for mooring, hauling or landing. Enjoy nature to its fullest in a beautiful, safe setting. Hemlow Island is situated in Liscomb Harbour close to the mainland. Years ago the island was inhabited and had the first general store in the area. The island is well treed with spruce, fir and some hardwood. The lot has south and west exposure, beautiful views, excellent area for boating – exploring the many islands and sand beaches, fishing for sea trout, salmon, mackerel and deep sea fishing, diving for scallops, digging clams, etc. Hemlow Island is located near the mainland and accessible by boat. Liscomb is approximately a 2 hour 15 minute drive east of Halifax city; the Historic village of Sherbrooke is 12 minutes away and offers most amenities, hospital, grocery & hardware stores, bank, drug store, liquor store, library, etc. Antigonish town is approximately a 50 minute drive.